Synopsis: Told from Igor’s perspective, we see the troubled young assistant’s dark origins, his redemptive friendship with the young medical student Viktor Von Frankenstein, and become eyewitnesses to the emergence of how Frankenstein became the man – and the legend – we know today. Review: If you’re looking for someone to blame for Victor Frankenstein, might I suggest Sherlock Holmes? A character brought to life so vividly in a series of novels and notable screen adaptations, Holmes has been resurrected to popular effect three times in the last decade. On the small screen he’s a present-day on the spectrum detective in two television series, one for the BBC (effectively launching Benedict Cumberbatch’s career in the process) and one for CBS (a more commercial offering, but no less successful) and on the big screen he’s a wise-acre troublemaking sleuth in Guy Ritchie’s two Holmes films. 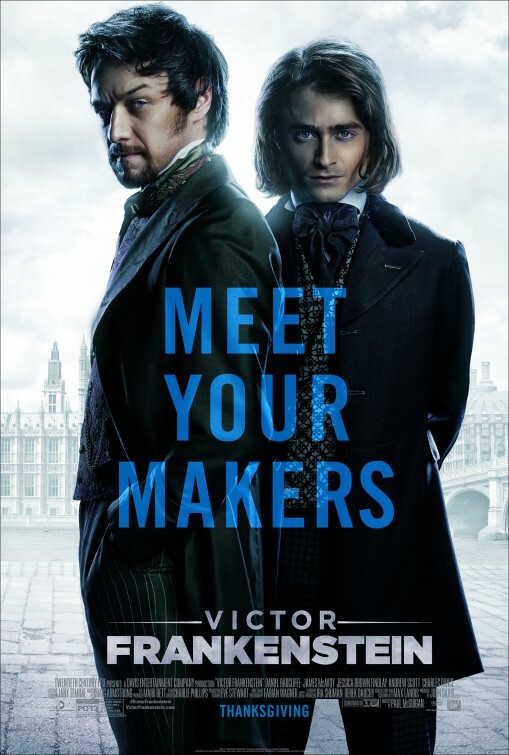 Possibly trying to exist in the same Victorian England Ritchie world, Victor Frankenstein is a slapdash creation, stitched together with little inspiration or motivation. It’s a true snoozer…and I know from experience because I fell asleep for part of it. Opening with the line “You know the story” and then, like all reimaginings must, going on to tell a totally different version of a time-worn tale, at first I was thinking that Victor Frankenstein was on to something. Told from the perspective of the man who would be Igor (Daniel Radcliffe, What If, The Woman in Black), starting out as a nameless and mistreated hunchback circus clown that studies medicine and dreams of a life with a pretty trapeze artist (Jessica Brown Findlay, Winter’s Tale), the first, oh, two minutes of the movie are visually impressive and intriguing. Then our titular character enters (James McAvoy, Trance) and our interest (and the scenery) gets shredded to bits. Rescuing the deformed man and employing him as his assistant, Frankenstein names him Igor (after his absent flat mate) and attends to his hunchback and crooked stance. Standing upright with a flat back, clean clothes, and a self-applied haircut delivered by straight razor that suggests a future as a coiffeur, Igor quickly gets up to speed with Frankenstein’s work in bringing the dead back to life. Originally working on a chimp hybrid that goes ape when roused from an eternal slumber, the two men are soon hired by a wealthy family to create something…bigger. In between gathering the pieces to assemble the ultimate creation, Igor continues to woo the trapeze artist (now living as a ward to a wealthy businessman) and avoid a fire and brimstone detective (Andrew Scott, Spectre) that believes what Igor and Frankenstein are doing is against God’s will. There’s the requisite backstory to explain the method behind Frankenstein’s madness and some moral quandaries that are quickly vanquished, it all leads to a rain soaked finale aiming to be electrifying but can’t find a strong current. As much as Radcliffe tries to distance himself from the boy wizard that made him a household name, I’ve yet to be truly impressed by any of his post-Harry Potter work. Trapped by an outlandish script by Max Landis (Chronicle) and tonally blunt direction by Paul McGuigan, Radcliffe doesn’t have much to do but peer out from behind his shabby wig, gasp in horror at Frankenstein’s insanity, and make goo-goo eyes at his love. Brown Findlay has the presence of a rogue dust bunny and Scott simmers with a too-serious biblical rage that leans more toward hysterics than histrionics. Nothing compares to McAvoy’s unhinged, abysmally over-the-top performance, though, and like it or not you have to give the actor credit for not being afraid to fail. Possibly recognizing the only way to be memorable in an otherwise dull creature feature is to be more outsized than his muscle bound creation, McAvoy is amped up from frame one and ready to go for the campy gold. Were the rest of the film less serious in nature, McAvoy’s take might have worked better but here is feels like the actor is out of control. Technically sound with a good eye for period detail, the money in Victor Frankenstein was clearly spent in the right places like Jany Temime’s (Skyfall) pleasing costumes and Eve Stewart’s (Les Misérables) sumptuous production design. It’s just a shame that all of the funds went to waste in a film with no pulse.